This event takes place in conjunction with CELP’s Annual Event, Celebrate Water. You can attend just the CLE or BOTH! Eating fish is the primary way that humans are exposed to PCBs, mercury, and many other toxic pollutants. We know these chemicals cause cancer, permanent neurological damage, and other harms. Yet fish, if they aren’t contaminated, are an excellent source of protein, omega fatty acids, and other nutrients. Doctors would like to see people eat more, not less, of this healthful food. So the question becomes: how much fish can we safely consume? Everyone knows that Washington’s current fish consumption standard is unreasonably low, but the state has been reluctant to adopt a more protective standard, like that of Oregon, because a more protective standard will require more stringent pollution and clean-up standards for Washington’s waterways—standards that industry asserts are unachievable. Professor Catherine O’Neill of Seattle University School of Law will provide new insights into the legal and scientific complexities underpinning this hot button policy issue. Professor O’Neill has written extensively on the legal issues underpinning this important policy decision that implicates civil rights, environmental justice, human health and natural resource protection, including: Fishable Waters (American Indian Law Journal, 2013); No Mud Pies: Risk Avoidance as Risk Regulation (Vermont Law Review, 2007); Mercury, Risk, and Justice (Environmental Law Reporter, 2004); and Variable Justice: Environmental Standards, Contaminated Fish, and “Acceptable” Risk to Native Peoples (Stanford Environmental Law Journal, 2000). Read Professor O’Neill’s recent OpEd with Frank James on fish consumption in The Seattle Times here. Professor O’Neill was a Ford Foundation Graduate Fellow at Harvard Law School. She came to the Northwest in 1992 as an environmental planner and air toxics coordinator for the Washington State Department of Ecology. From 1994 to1997, she was a Lecturer at the University of Washington School of Law. From 1997 to 2001, Professor O’Neill was Assistant, then Associate Professor at the University of Arizona College of Law. She is a Professor at Seattle University School of Law and is a Faculty Fellow with the Law School’s Center for Indian Law & Policy. Professor O’Neill’s research focuses on issues of justice in environmental law and policy; in particular, her work considers the effects of contamination and depletion of fish and other resources relied upon by tribes and their members, communities of color and low-income communities. She has worked with the National Environmental Justice Advisory Council on its Fish Consumption Report; with various tribes in the Pacific Northwest and the Great Lakes on issues of contaminated fish and waters; and with environmental justice groups in the Southwest on air and water pollution issues. Professor O’Neill has testified before Congress on regulations governing mercury emissions from coal-fired power plants. She has also served as a pro bono consultant to the attorneys for the National Congress of American Indians and other tribes in litigation challenging these mercury regulations. Professor O’Neill is a Member Scholar with the Center for Progressive Reform. 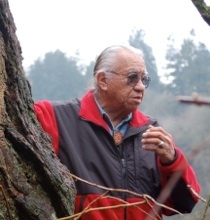 In Honor of One of the Northwest’s Greatest Leaders: Billy Frank, Jr.
Today, we lost one of the nation’s and the state’s greatest leaders: Billy Frank, Jr.
Billy Frank, a Nisqually tribal member, changed history. He helped spark the grassroots resistance of tribal people in the late 1960s and 1970s against Washington State’s illegal policy of prohibiting fishing off-reservation. Billy was arrested over 50 times during the “fish wars” as were many other tribal leaders. That struggle ended up in the courts. United States v. Washington, also known as the Boldt decision, made the 20 treaty Indian tribes in western Washington co-managers of the salmon resource with the State of Washington and re-affirmed the tribal right to half of the harvestable salmon returning to western Washington. We at CELP offer our deepest condolences to Billy’s wife and family, his colleagues and friends at the Commission, and the members of the Western Washington tribes that the Commission represents. We are all grieving the loss of a leader and a friend who worked to unite us all, never flinched from a tough position, and whose warmth and wicked sense of humor kept us going. The world is less vibrant with his passing. 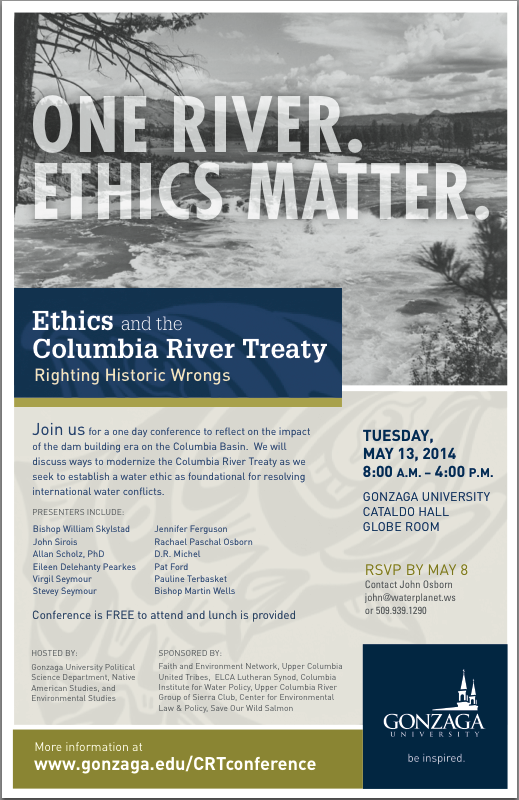 Join us for a one day conference as we seek to modernize the Columbia River Treaty, restore health to the river and return salmon to ancestral spawning waters, and establish a water ethic as foundational for resolving international water conflicts. You can view the conference program here. RSVP by May 8: John@waterplanet.ws Please share with others interested in ethics, rivers, stewardship and justice.